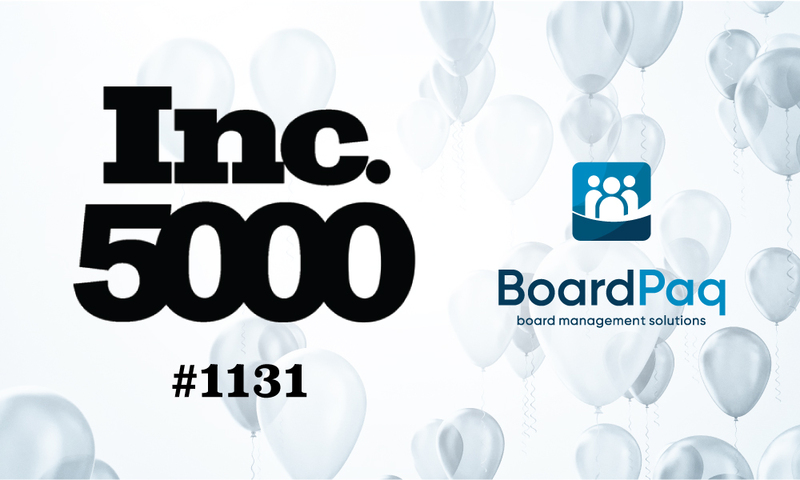 BoardPaq, the board portal of choice for more than 1,000 organizations, is proud to announce its inclusion on the prestigious Inc. 5000, coming in at #1131 on the publication’s list of the fastest growing companies in America. The five-year-old company provides the most robust and innovative board portal available to a variety of cost-conscious organizations, including community banks, credit unions, nonprofits, rural electric cooperatives, school boards, trade associations, and many others. The past 12 months have seen BoardPaq achieve several milestones, including the release of multiple new features, onboarding its 1,000th customer, and being named one of the 25 fastest growing privately held companies headquartered in the St. Louis metropolitan region. If you serve on or work for a board of directors, BoardPaq would be proud to add you to a growing list of organizations that have made us their board portal of choice. Contact the BoardPaq team and schedule a demo today.